Rosenheim is a Landkreis (district) in the south of Bavaria, Germany. Neighboring districts are, clockwise from the west, Miesbach, Munich, Ebersberg, Mühldorf, and Traunstein, with the Austrian province Tirol across the southern border. The district entirely surrounds the city of Rosenheim, which is independently administered but hosts the district's administration; both the city and the district share the "RO" designation for their license plates. 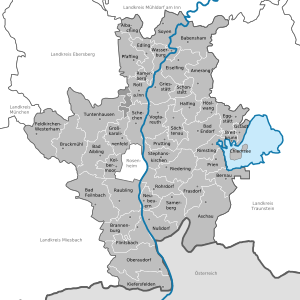 The district was created in 1972 when the former districts Rosenheim, Bad Aibling, and parts of Wasserburg am Inn were merged. The Rosenheim district is located in the foothills of the Alps, the Chiemgau. The landscape is dominated by moraines created by the Inn Glacier in the last glacial period, including many lakes. To the east of the district is the largest of these lakes, the Chiemsee. The main rivers in the district are the Inn and the Mangfall, which meet in the city of Rosenheim. Mountain ranges in the south of the district include the Chiemgauer Alpen and the Mangfallgebirge, which also contains the Wendelstein, at 1,838 metres (6,030 ft) the highest elevation in the district. The coat of arms includes the distinctive Bavarian fusily at the top. The crossed leaves of the water lilly on the left are taken from the Frauenchiemsee coat of arms, symbolizing the Chiemsee area of the district, and the red lion represents the city of Wasserburg. The coat of arms was granted in 1976. Wikimedia Commons has media related to Landkreis Rosenheim. This page was last edited on 15 April 2019, at 23:12 (UTC).